The economy of Pakistan is the 23rd largest in the world in terms of purchasing power parity (PPP), and 38th largest in terms of nominal gross domestic product. Pakistan has a population of over 207 million, giving it a nominal GDP per capita of $1,641 in 2018, which ranks 147th in the world and giving it s PPP GDP per capita of 5,709 in 2018, which ranks 130th in the world for 2018. However, Pakistan's undocumented economy is estimated to be 36% of its overall economy, which is not taken into consideration when calculating per capita income. Pakistan is a developing country and is one of the Next Eleven countries identified by Jim O'Neill in a research paper as having a high potential of becoming, along with the BRICS countries, among the world's largest economies in the 21st century. The economy is semi-industrialized, with centres of growth along the Indus River. Primary export commodities include textiles, leather goods, sports goods, chemicals, carpets/rugs and medical instruments. The office of the Prime Minister was created on immediate effect after the partition and the establishment of Pakistan in 1947; the Prime Minister existed alongside the Governor-General who was the representative of the British Monarchy. The first Prime Minister, Liaquat Ali Khan, exercised central executive powers until his assassination in 1951. However, the powers slowly began to be reduced as a result of constant intervention by the Governor-General. Despite the first set of the Constitution giving central power in 1956, the next six prime ministers were dismissed by the Governor-General from 1951 till 1957. In addition, the first set of the Constitution had evolved the Governor-General into the President of Pakistan whilst declaring the country an "Islamic republic". In 1958, President Iskandar Mirza dismissed the seventh prime minister to impose martial law in a mere two weeks, President Mirza was ousted by army chief General Ayub Khan who had for a brief period held the post of Prime Minister. In 1962, the second set of the Constitution completely dissolved the office of prime minister as all powers were transferred to the President of Pakistan. Criticism over the presidency after the presidential election held in 1965 over the centralizing of powers. After the general elections held in 1970, the office was established with Nurul Amin becoming the Prime Minister who was also the Vice-President. Negotiations that fall apart between Zulfikar Ali Bhutto, Mujibur Rehman, and Yahya Khan that prompted to liberation movement in the East Pakistan. With India intervening in East Pakistan and Pakistan conceding defeat to end the war led to the collapse of the presidential system in 1971. The Constitution of 1962 was the fundamental law of Islamic Republic of Pakistan from June 1962 until martial law was declared in March 1969. It was abrogated in the same year by president Yahya Khan. Nurul Amin, referred to as the Patriot of Pakistan, was a prominent Pakistani leader, and a jurist. He is noted as being the last Bengali leader of Pakistan. As the comprehensive Constitution reinstated in 1973, the post was reestablished with more central powers as the constitution provided a parliamentary system with President of Pakistan as figurehead. Amid agitation instigated by the right-wing alliance invited the military intervention in 1977 which suspended the post. The prime minister is elected by the National Assembly. The National Assembly meets on the twenty-first day after a general election (at least every five years) unless the President calls for a vote of no confidence. Whichever member of the National assembly is chosen serves as the Prime Minister until the next election or until he fails to maintain the confidence of the National Assembly. The Fourteenth Amendment to the Constitution of Pakistan was an amendment to the Constitution of Pakistan passed in 1997, during the government of Prime Minister Nawaz Sharif, leader of the Pakistan Muslim League party. It subjected Members of Parliament to very strict party discipline. Party leaders received unlimited power to dismiss any of their legislators from Parliament if they spoke or voted against their party. Chaudhry Pervaiz Elahi is a Pakistani politician who is the current Speaker of the Provincial Assembly of the Punjab, in office since August 2018. He has been a member of the Provincial Assembly of the Punjab since August 2018. Shahid Khaqan Abbasi is a Pakistani politician who served as the 21st Prime Minister of Pakistan from August 2017 to May 2018. A senior member of the Pakistan Muslim League (Nawaz) (PML-N), he has been a Member of the National Assembly of Pakistan since October 2018. Previously, he was a member of the National Assembly from 1988 to 1999 and again from 2008 to 2018. 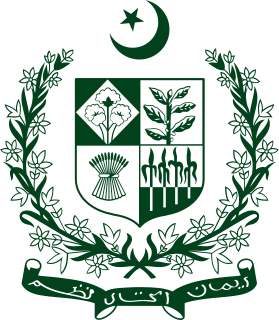 The Cabinet of Pakistan is a formal body composed of senior government officials chosen and led by the Prime Minister. All cabinet members sworn in are designated Minister, and are seated at their respective ministries located in the Pakistan Secretariat. The Nineteenth Amendment to the Constitution of Pakistan is a 2011 amendment reforming the judicial appointments procedure as well as expanding the Federally Administered Tribal Areas (FATA). The Caretaker Prime Minister of Pakistan is the head of government in Pakistan following the dissolution of the National Assembly. The purpose of this post is to ensure free and fair elections are held. The most recent Caretaker PM was former Chief Justice Nasirul Mulk, who took office on 1 June 2018, after the National Assembly dissolved, then resigned the office when Imran Khan was sworn in on 18 August 2018. Composite Nationalism and Islam, titled Muttahida Qaumiyat Aur Islam is a book written in 1938 by Maulana Syed Husain Ahmad Madani espousing a united India for both Muslims and non-Muslims. The book opposed the partition of India and in it Madani advocated for "the ideal of a 'composite nationalism' within an united India, which he thought would be more conducive to the spread and prosperity of his community over the entire subcontinent than any religious partition." ↑ "Heads of State, Government and Ministers for Foreign Affairs" (PDF). UN. United Nations Foreign and Protocol Service. ↑ "Will live in military secretary's residence, not in PM House, says Pakistan Prime Minister Imran Khan". The Financial Express. 20 August 2018. Retrieved 26 August 2018. ↑ "PM-elect to stay in a residence near PM House: Naeemul Haq". Pakistan Today. 17 August 2018. Retrieved 26 August 2018. ↑ "Imran Khan to live in PM House colony, says Naeemul Haq". Daily Times. 18 August 2018. Retrieved 26 August 2018. ↑ Azeem, Munawer (1 August 2018). "Imran Khan to move into Ministers' Enclave". Dawn News. Retrieved 26 August 2018. ↑ "PM Imran shifts to military secretary's residence". The Nation. 20 August 2018. Retrieved 26 August 2018. ↑ "PM Imran moves to military secretary's residence". Geo News. 26 August 2018. Retrieved 26 August 2018. ↑ Idrees, Mahmood (20 August 2018). "Imran Khan leaves palatial PM House forever to stay at military secretary's residence". Daily Pakistan Global. Retrieved 26 August 2018. ↑ "The austerity prime minister Imran Khan leads by example". The National. 21 August 2018. Retrieved 26 August 2018. ↑ Amjad Khan, Ameen (27 July 2018). "Imran Khan vows to convert PM House into a university". University World News. Retrieved 26 August 2018. ↑ "Change will begin from PM House, says Imran Khan". Khaleej Times. 19 August 2018. Retrieved 26 August 2018. ↑ Hughes, Amani (8 August 2018). "Imran Khan net worth: How much is new Pakistan Prime Minister worth? What is PM's salary?". Express UK. Retrieved 1 September 2018. ↑ "Prime Minister's monthly income less than parliamentarians, ministers and judges - Pakistan". Dunya News. 17 September 2018. Retrieved 1 September 2018. ↑ "The salary that we are not paying the PM". Dawn News. 10 September 2017. Retrieved 1 September 2017. ↑ Article 90(1) in Chapter 3: The Federal Government, Part III: The Federation of Pakistan in the Constitution of Pakistan. 1 2 3 "Prime minister". BBC News. 16 October 2008. Retrieved 8 September 2012. ↑ Article 91(1) in Chapter 3: The Federal Government, Part III: The Federation of Pakistan in the Constitution of Pakistan. ↑ Article 153(2a)-153(2c) in Chapter 3: Special Provisions, Part V: Relations between Federation and Provinces in the Constitution of Pakistan. 1 2 Govt. of Pakistan (3 March 2010). "The National Command Authority Act, 2010" (PDF). Islamabad: National Assembly press. National Assembly press. Retrieved 6 May 2015. ↑ et. al (2012). Pakistan Country Study Guide Strategic Information and Developments. Intl Business Pubns USA. ISBN 978-1438775258. ↑ Article 243(2)) in Chapter 2: The Armed Forces. Part XII: Miscellaneous in the Constitution of Pakistan. ↑ Article 46 in Chapter 1: The President, Part III: The Federation of Pakistan in the Constitution of Pakistan. 1 2 "Pakistan Supreme Court orders arrest of PM Raja Pervez Ashraf". BBC. 15 January 2013. ↑ Singh, R.S.N. (2008). The military factor in Pakistan. New Delhi: Frankfort, IL. ISBN 978-0981537894. ↑ Mughal, M Yakub. "Special Edition (Liaqat Ali Khan)". The News International . Archived from the original on 21 January 2012. Retrieved 8 September 2012. ↑ "The Constitution of 1956". Story of Pakistan. 1 June 2003. Retrieved 8 September 2012. 1 2 Nagendra Kr. Singh (2003). Encyclopaedia of Bangladesh. Anmol Publications Pvt. Ltd. pp. 9–10. ISBN 978-81-261-1390-3. ↑ "The Constitution of 1962". Story of Pakistan. 1 June 2003. Retrieved 8 September 2012. ↑ "The Constitution of Pakistan". infopak.gov.pk. Archived from the original on 9 November 2007. Retrieved 8 September 2012. ↑ Dossani, Rafiq; Rowen, Henry S. (2005). Prospects for Peace in South Asia. Stanford University Press. pp. 42–43. ISBN 978-0-8047-5085-1. ↑ "Benazir Bhutto Becomes Prime Minister". Story of Pakistan. 1 June 2003. Retrieved 8 September 2012. ↑ Akbar, M.K (1998-01-01). "Pakistan Under Navaz Sharif". Pakistan Today. New Delhi, India: Mittal Publications. p. 230. ISBN 978-81-7099-700-9 . Retrieved 8 September 2012. ↑ "Pakistan after the coup: Special report". BBC News. 12 October 2000. Retrieved 8 September 2012. 1 2 "Seventeenth Amendment 2003". Story of Pakistan. 1 June 2004. Retrieved 8 September 2012. ↑ "Shaukat Aziz profile from BBC". BBC News. 19 August 2004. Retrieved 8 September 2012. ↑ "Yousaf Raza Gillani profile from BBC". BBC News. 19 June 2012. Retrieved 8 September 2012. ↑ "Eighteenth Amendment to the Constitution of Pakistan" (PDF). 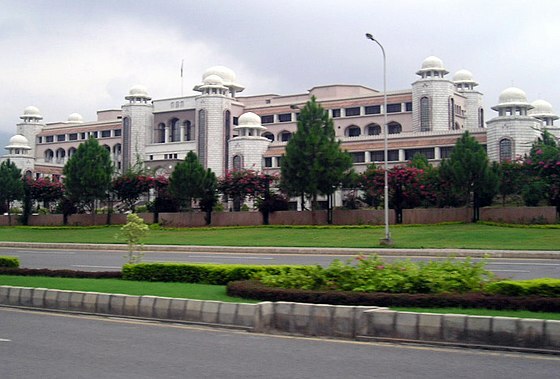 National Assembly of Pakistan. Archived from the original (PDF) on 1 June 2011. Retrieved 8 September 2012. ↑ "Pak SC disqualifies Gilani; new PM to be selected soon". Hindustan Times . 19 June 2012. Retrieved 8 September 2012. ↑ "Pakistan Peoples Party nominates Makhdoom Shahbuddin as new PM". The Times of India . 20 June 2012. 1 2 Nabi, Muhammad (22 June 2012). "Raja Pervez Ashraf nominated new Prime Minister of Pakistan". Business Recorder . Retrieved 8 September 2012. ↑ "Raja Pervez Ashraf declared new Pakistani PM". The Dawn. 22 June 2012. Retrieved 22 June 2012. ↑ "PPP nominates Raja Pervez Ashraf as new Pakistan PM". The Times of India. 22 June 2012. Retrieved 8 September 2012. ↑ Raza, Syed Irfan (11 August 2018). "Imran to take oath as PM on August 18: PTI". Dawn. Pakistan. Retrieved 12 August 2018. 1 2 3 4 5 6 7 "Chapter 3: "The Federal Government" of Part III: "The Federation of Pakistan"". pakistani.org. ↑ "Chapter 3: "Special Provisions" of Part V: "Relations between Federation and Provinces"". pakistani.org. ↑ "Chapter 2: "Majlis-e-Shoora (Parliament)" of Part III: "The Federation of Pakistan"". pakistani.org. ↑ Hanif, Mohammad (13 May 2013). "Pakistan elections: how Nawaz Sharif beat Imran Khan and what happens next". The Guardians, Pakistan Bureau. The Guardians. Retrieved 20 May 2015. ↑ Boone, Jon (17 May 2013). "Nawaz Sharif: rightwing tycoon who has won over liberals – for now". The Guardians. The Guardians. Retrieved 20 May 2015. ↑ Aziz, Mazhar (2007). The Military Control in Pakistan: The Parallel State. United States: Routledge. ISBN 978-1134074105 . Retrieved 20 May 2015. ↑ Omar, Imtiaz (2002). Emergency powers and the courts in India and Pakistan. England: Kluwer Law International. ISBN 978-9041117755. ↑ Article 248(1) in Chapter 4: constitutionGeneral of Part XII: Miscellaneous in the Constitution of Pakistan. ↑ Walsh, declan (19 June 2012). "Political Instability Rises as Pakistani Court Ousts Premier". The New York Times. New York Times, Pakistan Bureau. Retrieved 20 May 2015. ↑ Nauman, Qaiser (19 June 2012). "Pakistan Supreme Court disqualifies prime minister". Reuters, Pakistan Bureau. Reuters. Retrieved 20 May 2015. ↑ "Pakistan Supreme Court disqualifies prime minister". Dawn. 28 July 2017. Retrieved 28 July 2017. ↑ Article 91 in Chapter 3: of the Constitution of Pakistan. Hasanie, Ali Abbas (2013). Democracy in pakistan : crises, conflicts and hope for a change. [S.l. ]: Authorhouse. ISBN 978-1481790680 . Retrieved 6 May 2015.